Thanksgiving marks a critical juncture in the NFL schedule. The 2012 Pittsburgh Steelers began Thanksgiving weekend with a 6-4 record, not world beating but something to be built upon, and finished the season at 8-8. In contrast, the ’05 Steelers and ’08 brethern put the pedal to the metal between Thanksgiving and New Years. The NFL’s hypocrisy and Kangroo Court nature of justice under Roger Goodell are plain for the world to see. Before continuing, let’s make one thing clear. Steel Curtain Rising does not subscribe to the idea that Goodell has a vendetta vs. the Steelers. In 2008 Goodell made it abundantly clear to Tim, John, Pat and Art Rooney, Jr. that he would do everything in his power to ensure that Dan Rooney and not Stanley Druckenmiller, owned the Steelers. But the Steelers, like the rest of the NFL, are victims of his mercurial whims and rules that defy logic. In front of a national TV audience Le’Veon Bell scored a touchdown vs. the Baltimore Ravens on Thanksgiving night. Four officials signaled it. In the ensuring helmet-to-helmet collision, Bell’s helmet came off. He and the defender left the game concussed. Yet, because the helmet came off before he crossed the goal, the touchdown was void. The officials were sticking to the letter of the law. Declaring a play over when a helmet comes off makes sense. To allow helmetless playing to continue would open players to serious injury. But in this case it creates a perverse incentive. Defenders in goal line situations now have an reason to try to remove a ball carrier’s helmet. Sure, that would involve a penalty, but similar to intentional use of the hands by a non-goalie in soccer (see Uruguay’s team in the 2010 World Cup) some players might decide its worth the risk. This is a hard case to legislate, and wouldn’t be a “Big Deal” if it were the worst. But its not…. That same Thanksgiving game saw Mike Tomlin step out on the field illegally. No flag was thrown, but Tomlin was fined, as he should have. But of course in Goodell’s NFL, justice neither fair nor or consistent. At least that was the early word. A week later, the reports indicated that the Steelers would in fact lose draft picks. Of course there was nothing official about this, all news came via leak. Steel Curtain Rising has already called Goodell out for the Kangaroo Court nature of this incident, but the NFL’s hypocrisy has gotten worse since then. That’s a Miami special teams coach Darren Rizzi clearly standing on the field of play during the Dolphin’s last second field goal attempt at the end of the first half. You know, the one where the Steelers almost scored on the return? As the photo reveals, the official collided with Rizzi. Yet no flag was thrown. The NFL did announce a 10k fine. So a head coach almost bumping into someone on the field is worth 100k, but a special teams coach actually bumping into an official is only worth 10k? The difference in fines is defensible, but yhe worst part of this is that the NFL refuses to apply its own logic. Miami should have been penalized for the coach-official collision. It wasn’t. A half cannot end on a defensive penalty. 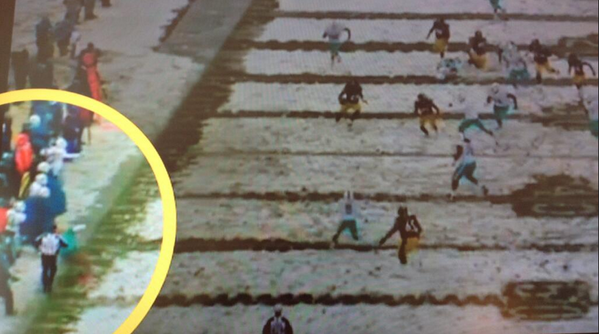 So the Steelers should have gotten the ball on Miami’s 26 yard line with a free play. Or Tomlin might have decided to let Ben Roethlisberger see if he could hook up in the end zone with Emmanuel Sanders, Jerricho Cotchery, or Heath Miller. Although Miami beat Pittsburgh by 6, 3 points could have changed the dynamic dramatically of the second half. This doesn’t excuse the Steelers poor play which led the loss. But given that Miami’s fine is less than the Steelers and they’re not losing draft picks, it does expose the horrendous hypocrisy behind Roger Goodell’s administration of NFL justice. As everyone knows, the Steelers first return for a touchdown in eons, thanks to Antonio Brown, was made possible by an illegal hit by Terence Garvin on the Bengals punter. Garvin made contact with the helmet, but that wasn’t his only infraction. Kickers and punters are considered to be defenseless players, and hence cannot be hit above the shoulders. That’s right. Even though Kevin Huber was trying to tackle Brown, even though Shaun Suisham has the same number of tackles as Curtis Brown, kickers are defenseless. This is totally inane. There’s no way kick return teams can be expected to stop and check to see if a would-be tackler is a kicker or not. That’s not even good science fiction. The rule defies logic. Don’t expect it to change soon. This is Goodell’s NFL. What? Change of Possession Not Reviewable? Steelers get hit with an illegal batting penalty – you’re not allowed to bat a loose ball to your own end zone. But wait, Clark had possession and was down by contact, Mike Tomlin protested. No, argued the ref, possession on this play is not reviewable. What? That’s right, you can review whether a quarterback’s arm moved a millimeter forward, you can challenge an inch or two on the spot of the ball, but you apparently can’t review change of possession on a blocked kick? Justice should be blind and impartial. Yet, justice in Roger Goodell’s NFL, vision is selective and it is very partial, partial to Goodell’s whim of the moment. Goodell is not concerned with “fair.” He’s never said he doles out “fair” punishment. He doles out punishment intended to make headlines and deter players/teams from repeating similar behavior. But as the above incidents highlight, Goodell’s not having that effect. These Steelers-centric examples of illogical rules, uneven punishment, and blown calls have plagued the rest of the NFL this entire season. Goodell would do well to begin focusing on being fair, because his arbitrary administration of justice combined with illogical rules have reached a point where even the most avid NFL fans are questioning the integrity of the game. Does Roger Goodell really want that as his legacy? Because right now this is the direction he is heading in. This entry was posted in Steelers 2013 season and tagged Antonio Brown, Ben Roethlisberger, League Matters, Mike Tomlin, Pittsburgh Steelers, Steelers special teams, Steelers vs. Bengals, Steelers vs. Dolphins, Steelers vs. Packers, Steelers vs. Ravens. Bookmark the permalink. I think, in several cases, you’re blaming Goodell for something the Competition Committee did. Fair point. But Goodell at the end of the day is the one running the show, the one who ultimately is responsible. His “Justice is what I say it is” sets the tone which I think is conducive to a lot of the other illogic, which perhaps he is not directly responsible for.